I just found my dog Kreiger frozen to death. It appears he was hit by a car and couldn’t make it home. I have never known a more loyal friend. My heart is heavy with sorrow but I am trying hard to remember the amazing times we have had together. They were too numerous to recount on here but I can say I feel so truly blessed to have raised such a great pet/friend. His loyalty was un questionable. He was as brave as a Spartan warrior. As gentle as the breeze on a summers day. Steadfast, confident and always there for me. He will live on in my heart and memory until my last breath. Many thanks to the thousands of people who have helped me in the months long search. You are all amazing and have shown me a side of humanity I wasn’t aware existed. I can’t thank you all enough for your help. R.I.P. Kreiger. 2011-2018. Rest easy my friend. 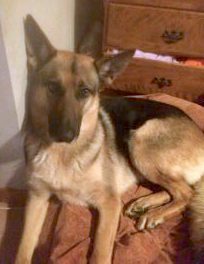 Additional Notes: Kreiger (Kree-gr) is a 93lb German Shepherd. He has black, tan and brown long fur. He has a lean build and is very friendly. He loves to play stick. He slipped his collar around 4pm January 8th, 2018. He has a microchip. Is this dog more reddish brown than he looks in the picture? I may have seen him on Meadowbrook Drive in Beaver Bank yesterday. A German Shepherd type dog crossed the street down the road as I was driving and it was not familiar to me. Our neighbor spotted a german shepherd in his back yard that ran off into the woods yesterday am Jan. 11/17. This was on Davis Drive in Beaverbank. Same area as Meadow Brook. Will keep an eye out for your boy. Hope you find him soon. We talked to the owners of Kreiger about this other dog found near Mineville and it is definitely not Kreiger. Thank you though for sleuthing and helping out. If the link doesn’t work the person that posted was named Morgan Cottreau in Forest Glen. I want to thank everyone for the massive amount of help and love so far. Unfortunately Kreigar is still missing but we are continuing to share his absence and keeping our eyes and ears pealed, hopefully the attention and reward brings him home soon. Call at anytime with any information, please do NOT feel it is too late, or not enough of a lead. Thank you again in advance for all your help. My heartfelt condolences to you and family. My heart. I am sorry for your loss. Rest easy. Bigs Hugs. So sad to hear about Kreiger. Rest in Peace lovely Boy.